Catalonia is preparing its own tax system, and creating a network of foreign missions as it prepares for a snap regional vote on independence. Recently Spain’s top court ruled that the region’s symbolic referendum vote in November was unconstitutional. Nationalist leaders in the northeastern region have urged a snap local vote on the issue of independence on September 27, AFP reported. Catalan president Artur Mas and his government are reportedly working on tax, diplomacy, and social security restructuring in case Catalonia becomes an independent state. The focus is on taxation as the Catalan authorities now collect only 5 percent of the taxes raised in the region. 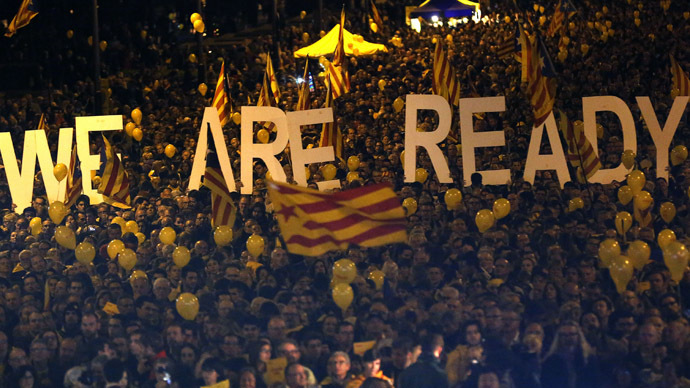 Last November, Catalan president Artur Mas organized a symbolic vote on independence, with 80 percent voting in favor. However, the turnout was only 40 percent. Catalonia has 7.5 million residents (16 percent of Spain’s population), and represents some 20 percent of the country’s GDP. Alone, the region could collect 100 billion euro in taxes yearly, much more than Catalonia would need if it becomes independent, said Joan Iglesias, a former Spanish tax inspector, who is now behind the Catalan tax reform. "Everyone knows that Catalonia would be viable economically. It is the most economically productive territory in Spain," Iglesias told AFP. Apart from the tax reform, Catalonia would need to establish its own central bank, upgrade computer systems and employ more civil servants. Also, the region says it needs to open more foreign offices. Currently, Catalonia is represented in the UK, France, Germany, the US, Belgium and has recently set up missions in Austria and Italy. In February, Mas set up a commission responsible for carrying out the tasks essential for an independent state. Plus, he ordered a study into the steps Catalonia needs to take to make sure the services like telecommunications would function in case of secession. However, “work is advancing too slowly,” Catalan lawmaker with the separatist Esquerra Republicana de Catalunya (ERC) party, Lluis Salvador, told AFP. “We need to streamline our efforts so we arrive at the elections in September at a much more advanced state." In the elections, separatist Catalan parties face opposition from new anti-austerity party Podemos, which is not supporting the region’s independence. European officials have warned Catalonia that it would have to leave the EU if it becomes independent. Earlier Scotland faced the same warning.